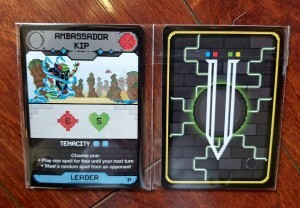 Promo cards (includes 4 additional Leader cards) for $5 or FREE with a purchase of either a t-shirt or set of coasters. Visit the Save Against Fear site http://www.thebodhanagroup.org/about-the-convention for more details about how you can join us for a great day of gaming! An additional 450 copies will be available in early November. The product is currently making it’s way to Pittsburgh, PA via ocean freight and updates will be provided once a delivery date is confirmed. Once the product arrives, the copies will be made available online for purchase. 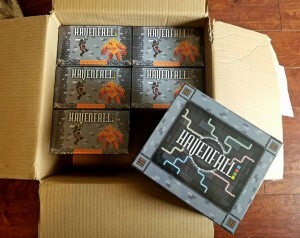 I seriously can’t wait to get my paws on Havenfall!!! Just a quick question is there a limit to the number a person can order? I’m wanting to buy one for me, my bro and my buddy. Thanks! Hi J.P. there is no limit on the number of copies players can purchase. The only item limited is 1 set of promo cards per game. Hey, just wondering if you’ll post an update in this [news] section once the games are up for sale, or if I should just keep an eye on the store section. Also, how fast do the copies sell? Should I just stay glued to this site hitting refresh like a madman? Thanks in advance!!! Thanks Joe! YOURE MY HERO!!!! Yea. They originally told us we would have the shipment in by November 1st. but they just meant it would get to customs. but that way delayed until the 6th. But at least today we finally got the shipment to our place! so we just need to get things organized and we are good to go! I noticed the game is posted in the store; however, when I try to select ordering options it says I need a password? Hi Periwinkle, we dont have the game for sale just yet. We are testing to make sure the product section is working correctly. Still waiting on the shipment to arrive. Should be any day now! I thought “Protected” was like some new AwEsOmE expansion. Anyway, thank you so much Joe, I love your game!! !